Rather than go over what each presentation covered, I thought I’d pick up on a few themes which emerged throughout the day. This seems to be an ongoing debate and one many people want a quick answer to. Sadly it’s not that straight forward; as with anything it depends in the context (I wrote a blog post about the differences between mobile apps and mobile web which included their advantages and disadvantages). General consensus about which is preferable seems to be shifting slightly as we see the introduction of more smartphones on different operating systems, driving a need for cross-compatible mobile websites rather than native apps. In order to utilise all the functionality of the phone’s hardware though (e.g. using the camera, storing data offline), an app is the way to go. For library resources from publishers, we’re definitely seeing a change to people requesting mobile compatible websites rather than mobile apps, largely because users of the library are encouraged to access resources from a variety of publishers and may not know the publishers who cover their research areas (and often don’t need to know). We’ve been doing some research into the mobile options publishers offer, which we’ll be sharing on the blog soon. One potential solution to designing for the mobile web is responsive web design which enables web developers to develop one website which will detect the device and size it is being displayed on and alter its appearance accordingly – see responsive web design demo. This is becoming more popular with major website providers, and a number of libraries are beginning to use this approach. Matthew Reidsma gave a presentation on the topic of responsive web design at the ALA Annual Conference 2012 which you can view online (blog post includes video, slides and other resources). This approach to web design ties in with the findings of Bohyun Kim in her ALA Annual Conference presentation also; that users now expect to use their mobile devices in a similar way to a desktop and therefore expect mobile websites to have the same information as a desktop site. Responsive web design can be a time-consuming process (particularly for large websites with a lot of content) so some feel it is not the right approach to take at present, though I have to say I think it is a useful exercise and believe we should be aiming to offer the same amount of information regardless of the device. Many of the people at the event were keen to pick the speaker’s brains about how to plan for the future. The message from James Clay’s presentation was very clear; libraries should be planning for the future now, rather than focusing on the present. But what do we need to plan for? It’s difficult to predict what we’ll be using in the future, especially in an area of such rapid growth. The main priority here is the need to keep up-to-date with the latest developments and consider their implications for libraries. In addition to keeping on top of innovations in technology (by subscribing to technology news feeds and blogs), we also need to consider adoption of the technologies within society and potential trends which may affect the ways users wish to use libraries in future (e.g. changing expectations of mobile websites). Martin White focused his presentation on the offerings of providers (in particular Apple, Google and Microsoft) and it was something mentioned in a number of the presentations. The decisions made by companies like these will impact which technologies are adopted and supported. For example, technologies such as near field communication will become more widespread if more devices include the technology, or QR code use could increase if a QR code reader was a standard part of a mobile devices’ camera rather than a separate app. We need to keep an eye on the technologies used by main technology companies, and also the smaller companies with innovative devices. As with anything, the underpinning message when considering using mobile technology to support library resources and services is understanding what users want. I was particularly interested to hear from George Buchanan about the feedback they got from students about the way they used mobile devices, and the fact that it was still largely for traditional activities such as calls and texts (though this was a small sample of students). Related to this, a number of projects in the JISC Mobile Infrastructure for Libraries programme have been involved in usability testing and gathering user feedback. See the following blog posts for further information – Usability testing from MACON at Open University and Phone Booth now and into the future from PhoneBooth at LSE. I’m sure others will blog their findings at a later date too. If you’re interested in finding out more about the event, you may want to look at the archive of #mobiletech2012 tweets. This entry was posted in Events and tagged CILIP, mobiletech2012, responsive web design, user survey on August 2, 2012 by Jo Alcock. Increasingly, Library users at Leeds Metropolitan University are requesting all kinds of mobile access, from expecting that our e-books and digital readings can be viewed on a e-book reader (sounds obvious, opens a huge can of worms) to asking if their timetable is available to view on a smartphone (yes it is!). What do users want via mobile? there is an overwhelming feeling against charging for any type of mobile application. increase the promotion of current services which already provide mobile access. For the longer term, we are now connecting with colleagues across the University to ensure that our mobile plans complement the direction of the pan-University mobile strategy. For further information please contact the Project Manager – Adam Watson (@adlab/a.a.watson@leedsmet.ac.uk) or Debbie Morris (@debbiemn/d.morris@leedsmet.ac.uk). This entry was posted in Case studies, Guest blog posts and tagged debbie morris, leeds met, user survey on April 23, 2012 by Jo Alcock. 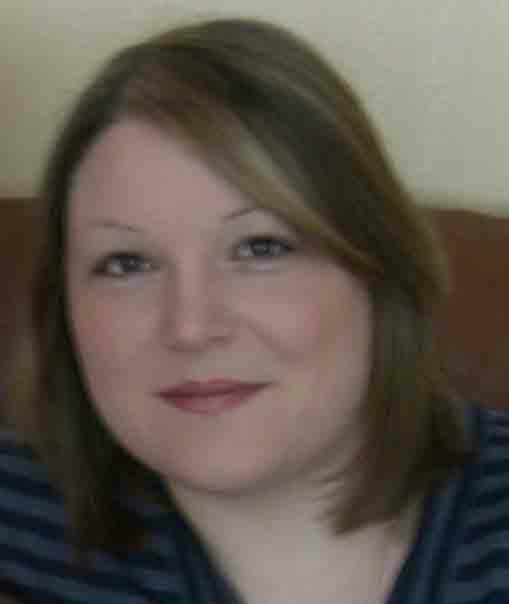 This post is a guest blog post from Meg Westbury, Projects Officer for Cambridge Judge Business School Information and Library Services. She tweets at @meg_librarian and blogs at Library Pie. 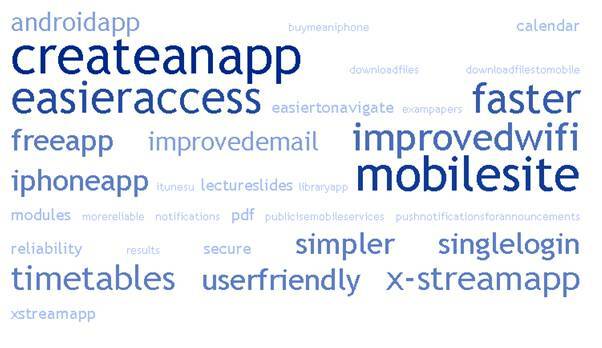 We want a mobile app – library specific or wider organisation app? In the summer of 2011, we decided to make a library app. We had just revamped our blog/website, but were not happy with how the site looked on mobile devices. We thought that an app would be the best way to deliver mobile content, as we reflected that we personally didn’t do much on our smart phones if there wasn’t an app for it! We planned to develop the app separately from the business school at large, as we thought it would be done quicker that way, but political and collaborative pressures led us in the autumn to team up with other departments to create a school-wide app, one component of which would be for library services. The app committee that was formed consisted of people from IT, Information & Library Services and staff from the school’s various programmes. From day one, the app has been thought of as being for current students enrolled at the school. Another approach could have been to make an app for external audiences, which largely presented information about the school’s programmes. But we wanted to make the app super useful – a Swiss army knife of sorts – that would help students get to information and services they needed quickly. To understand students’ needs, we set up two focus groups to have discussions about what ideally students would want out of an app. We asked for volunteers for these groups, and we gave them lunch: an approach which yielded two focus groups of about 5 students each, with representation across the school’s programmes. At the focus groups, we tried to make questions open ended, concentrating on asking about what information students regularly needed to find and what they currently found difficult about the process. The results were helpful though predictable. Students mainly felt frustrated about all the different places they needed to go for information (e.g., the school intranet, the library portal, their course VLE, etc.). With an app – i.e., with a single press of a button – they wanted all their most important information at their fingertips, especially information about timetables, library services, school events and room bookings. The focus groups were helpful and gave us a starting point for discussions about what the app should do overall, but we still didn’t feel we had a strong sense of what to prioritise and put into the first release. The focus groups generated a lot of ideas – too many really for the first version of the app — and we weren’t sure how the larger student body would rank those ideas. 137 students completed the survey, representing 23% of the students. 53% of the respondents were from the MBA and EMBA programmes, with the remainder from the various Masters, MPhil and PhD programmes. In terms of mobile device usage, 60% said they use Apple iPhones or iPads, and another 18% use Androids. 12% use Blackberries and 1% use Windows phones. The remaining respondents use other devices such as the Nokia Symbian. Not surprisingly, up-to-date information about time tables was first in both the suggestion- and ranking-portions of the survey. Not-so-predictably, however, was how high library services ranked. 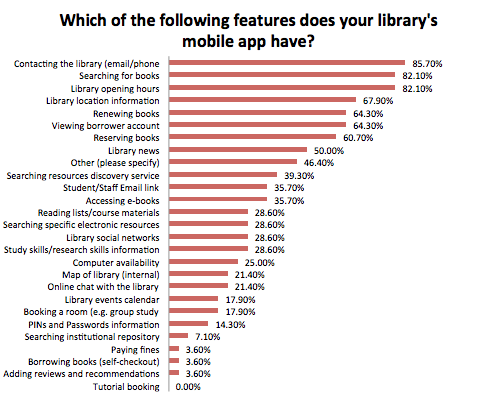 In the free-suggestion part of the survey, library services were the second-most frequently requested feature for the app (tied with information about school news and events). 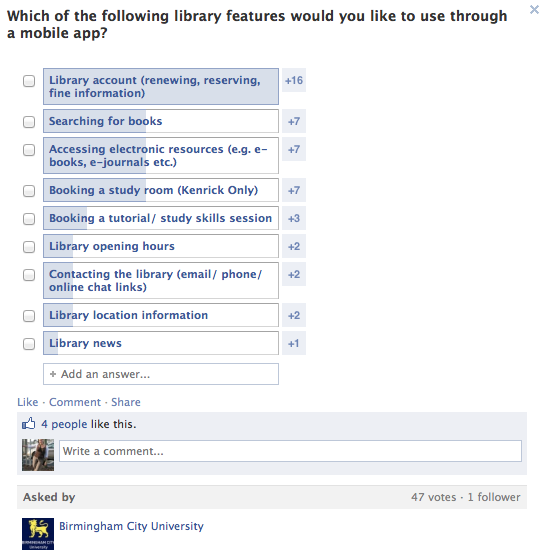 In the ranking part of the survey, 4 of the top 10 features prioritised by students were aspects of library services. Wow. We at Information & Library Services were pleased (ok, chuffed!) with the results, not least because they showed the school that we are not an antiquated little department, quietly guarding our dusty collection of books (which is how we seem to be perceived by some parts of the school). The students clearly said that along with other crucial information they regularly need, library services were an absolute necessity for their success as students. We are now working intently to have a version of the app ready for the new students in September 2012. We are proud that the first release will feature library services so prominently. It feels like a nice reward for all of the outreach, marketing and good public service we’ve done over the past years. The students very clearly value our resources. This entry was posted in Case studies, Guest blog posts and tagged cambridge judge business school, focus groups, mobile app, user survey on February 23, 2012 by Jo Alcock.